Information mostly comes from Wikipedia articles, some from intensive Google searching. Record sales in claimed sales. The origin of the act, not the later or current area was used. The origin was either where they were born (most of them) or where they formed, lived or practiced when they recorded first. Two of the biggest surpises are that Amy Winehouse comes from Enfield and not Camden, the area she is most closely associated with, and that the Rolling Stones are from quiet and leafy Sutton. Also note that the City has no best selling artist or band. Some of the best selling musical acts not to make to the top of any borough include: The Clash, Adele, Pet Shop Boys and Status Quo. Siouxsie was born in Southwark but lived in Chislehurst. This appears a little light. What about where artists died. At least in the Kookaburra we would have Hendrix instead of the starting out Pink Floyd(Sid Barrett not from round here shirley?). 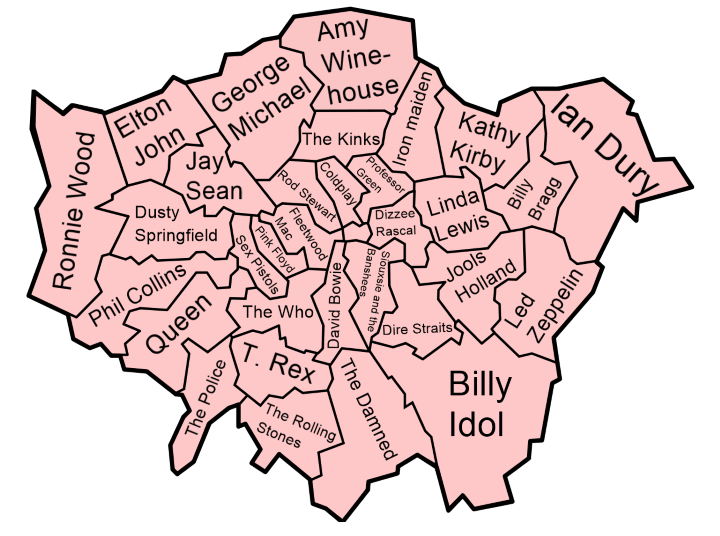 The classification of David Bowie for Lambeth and Billy Idol for Bromley annoys me. Neither where born in Bromley (Bowie was born in Brixton, Lambeth and Idol in Stanmore, Harrow) but both grew up there. Bowie is by far the bigger star and throughout his career was always known as a Bromley-boy. It’s only since his death that Brixtons nouveau hipsters have claimed him. You poor fella . That is a lot of weight for one retard . Kirby was born in Ilford, Essex, the eldest of three children of Irish parents. Her mother Eileen brought them up alone after their father left early in their childhood. Kirby grew up in Tomswood Hill, Barkingside, near Ilford, and attended the Ursuline Convent School in Ilford where she sang in the choir. Bowie was LB Bromley – born, bred, educated, married, first ever concerts. etc etc etc. and as others below have said, Siouxsie and the Banshees were not LB Southwark, another LB Bromley person, significant part of the Bromley Contingent, along with Idol. I see Brent has struggled to produce a class act – Jay Sean! I am not seeing the Merton connection for T Rex – Bolan formed the band, was born in Stoke Newington and lived in the Ladbroke Grove area when he started out. Rolling Stones AND Ronnie Wood get a borough each? Half of the Stones (Jagger n Richards) grew up in Dartford – the next Borough along from Bexley but not shown – and went to school there. Mum was a year below Mick at Dartford Grammar, so I’m not sure where the Sutton connection comes in. Mum also ended up living in Plaistow Grove in Bromley – 4 doors away from Bowie, and my local chinese when I was growing up in New Eltham in the late seventies was a certain ‘Hong Kong Garden’ in Chislehurst Village. Get in! Mark Feld lived in Summerstown (border of Wandsworth/Merton) for a while, he went to secondary school in Tooting, Ernest Bevin, that’s where the Merton connection comes from. Apparently he left Ernest Bevin, then known as Hillcroft School by mutual consent, which I gather meant You want to leave and we want you to leave, so you can leave..
Summerstown is where I was born and bread (good times)! Dartford is not shown because it is outside (London)! Half of the Stones (Jagger n Richards) grew up in Dartford – the next borough along from Bexley but not shown – and went to school there. Mum was a year below Mick at Dartford Grammar, so I’m not sure where the Sutton connection comes in. Mum also ended up living in Plaistow Grove in Bromley – 4 doors away from Bowie’s old house, and my local chinese take-away when I was growing up in New Eltham in the late seventies was a certain ‘Hong Kong Garden’ in Chislehurst Village. Get in! Amazing that there is no Madness on here. I appreciate that the reason behind that is that Rod Stewart has Camden. How is Dusty Springfield bigger than the Who? 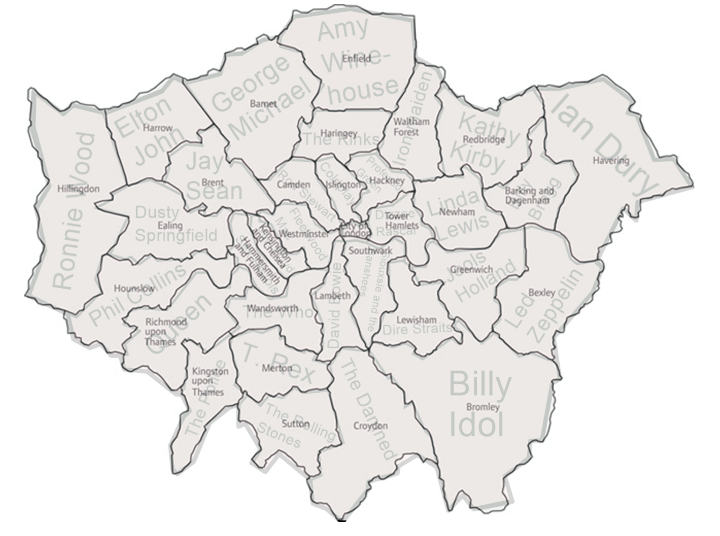 Freddie Mercury and Brian May are both from Feltham, in the LB of Hounslow. I’m not sure anyone in Queen has any connection with Richmond. Also Jay Sean is from Southall, in the LB of Ealing, not Brent; T Rex should definitely be in Hackney; Merton should probably be represented by Mumford & Sons; and I can’t see any connection between The Police and Kingston — maybe John Martyn would be more appropriate for the London Borough of Kingston.